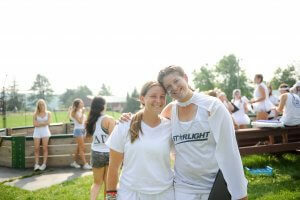 A significant number of our counselors are campers who just can’t get enough of Camp Starlight. Some of our veteran camp counselors and staff members started out as wide-eyed, excited, first-time campers who fell in love with sleepaway camp. The camp experience is ingrained so deep into their life that there’s no place they’d rather spend their summer. Some can barely remember a summer that wasn’t spent at Camp Starlight, and they love it that way. Former camper counselors, those who transition from camper to counselor, can share the love of sleepaway camp in a way that others can’t. New counselors can learn to fall in love with camp, but former camper counselors have this love embedded in who they are and naturally share this love with new campers. These counselors have experienced almost everything a camper can experience, so they’re able to relate with common new camper experiences. Camp Starlight loves all of our counselors, but there is a special place in our heart for full circle counselors. We’ve watched these campers grow and evolve into responsible young adults who are passionate about providing the best sleep away camp experience for every camper, just like a counselor did for them. This entry was posted on Monday, November 26th, 2018 at 8:41 am	and is filed under Summer 2019. You can follow any responses to this entry through the RSS 2.0 feed. You can leave a response, or trackback from your own site.